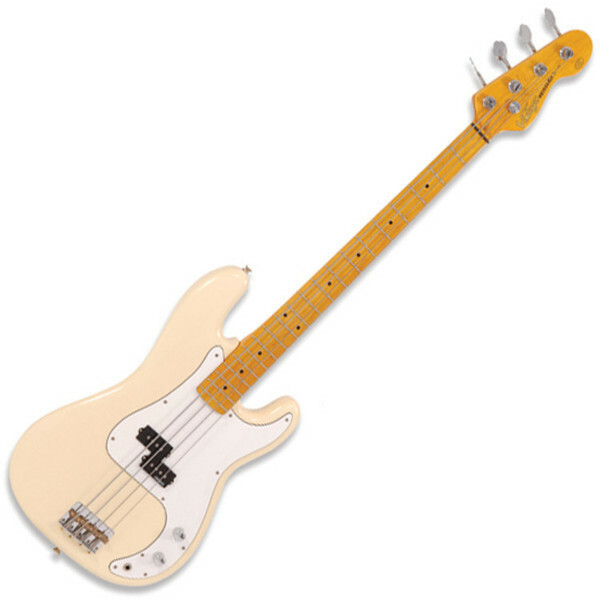 The Vintage V4 Reissued bass guitar is an excellent instrument at a great price. Extremely versatile and capable, it gets its great tone from the Wilkinson PB split coil pickup, with Alnico V magnets for maximum low end and an authentic feel. The Vintage White finish gives it the look of a classic right out of the box. The V4 features an Eastern poplar body with a hard maple bolt-on neck and a maple fingerboard. Other features include chrome hardware, volume and tone controls and an adjustable bridge. Scale Length: 864mm / 34"